My wife and have a 14 year old Weaton Terrier. In her older years she started getting sick a lot and would not eat. 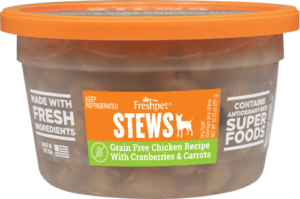 We heard about Freshpet products and said we would try it. We were amazed at the difference the food made. She has totally changed – she’s eating again and is a very active dog. Again, we are so grateful for the change. Thank you!